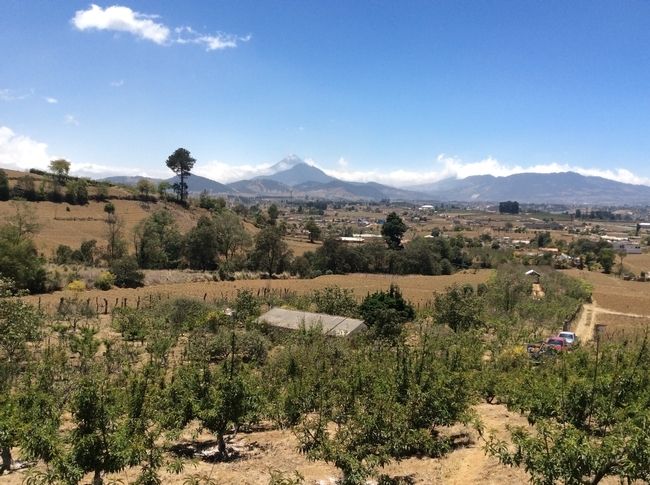 Peach trees in the highlands of Guatemala with a view of the Santa Maria Volcano in the distance. Did you know that apples and peaches are two important fruit crops planted in the highlands of Guatemala? More than 7,600 acres of apples and 6,100 acres of peaches are grown. However, with warm winters that don't allow for the winter chilling time that these crops require for optimal growth, and with freezing spring temperatures along with summer rains, growing apples and peaches in this area is often a challenge for growers. As part of the Farmer-to-Farmer Program sponsored by the Partners of the Americas and funded by the United States Agency for International Development (USAID), retired UC IPM entomologist Walter Bentley and Washington State University entomologist Jay Brunner traveled to Guatemala in April to help growers improve the peach and apple industry. 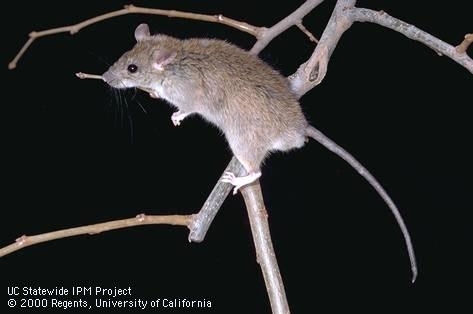 Their primary goal was to identify pest problems and possible solutions to help peach and apple growers improve fruit production, taking into account the region's unique climate. 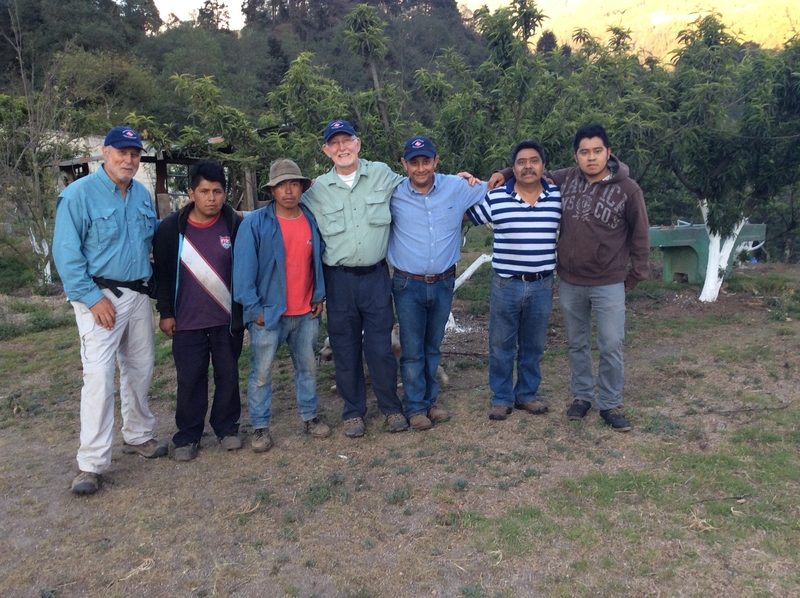 Jay Brunner (far left), Walter Bentley and Armando Hernandez (center), with family members from one of the farms visited. Some of the peach varieties require 300 to 500 chilling hours. 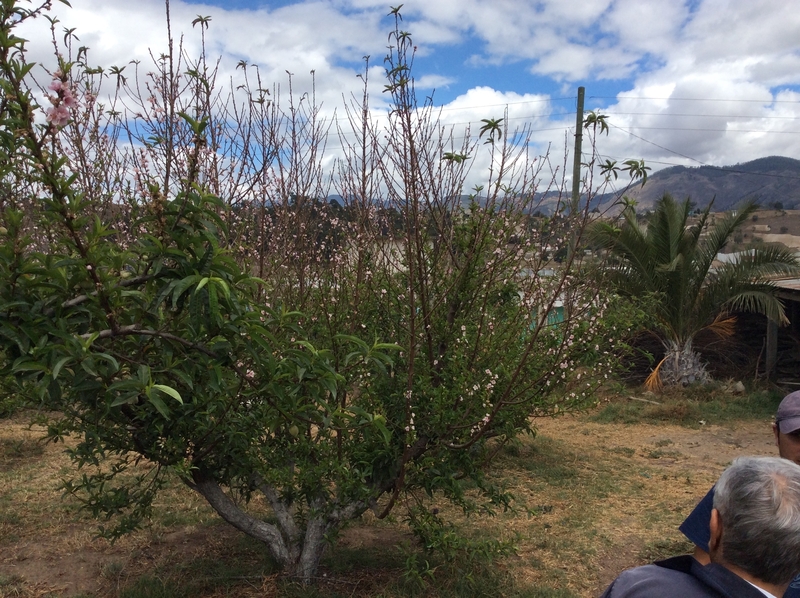 Top half of a peach tree in bloom while the bottom half produces fruit, caused by the lack of required winter chilling hours. However, with the warm winters, Bentley observed that peach trees growing in the regions of Quetzaltenango and Chichicastenango of Guatemala do not receive the required winter chilling hours, resulting in an extended bloom period. 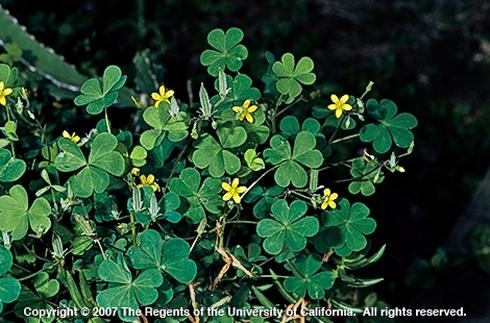 This creates an environment favoring disease development and causing further problems for growers if the disease was severe enough to warrant a pesticide treatment. If a tree was partially in bloom while simultaneously producing fruit, it would have to be hand-sprayed multiple times so that the portion of the tree that warranted treatment was sprayed. Walter Bentley shows examples of phytophthora root rot from the UC Integrated Pest Management for Stone Fruits manual. Summer rains create further problems in the area, causing favorable conditions for pathogens to develop, especially at harvest. 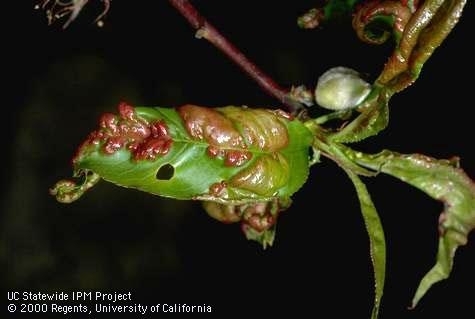 Brown rot, Phytophthora and rust are the three main diseases attacking apples and peaches in these regions. 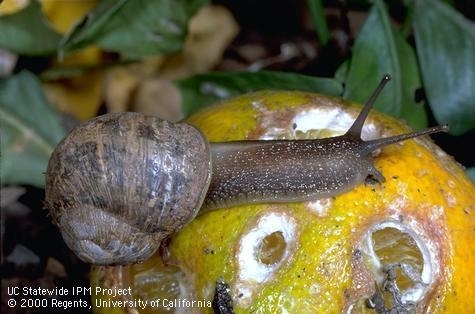 Although most of the important issues that Bentley and Brunner found were horticultural or disease-related, there were some insect problems. Many growers had stink bugs and other plant bugs attacking their trees. Spider mites and predatory mites were also observed. 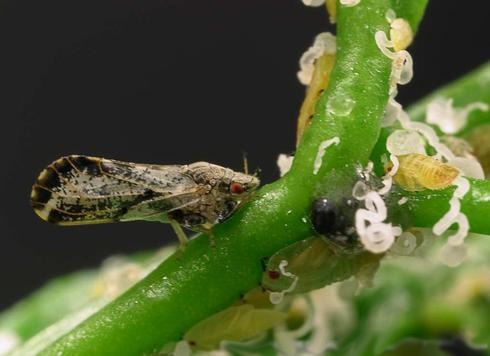 Growers sprayed pyrethroids after bloom to help prevent plant bug damage. 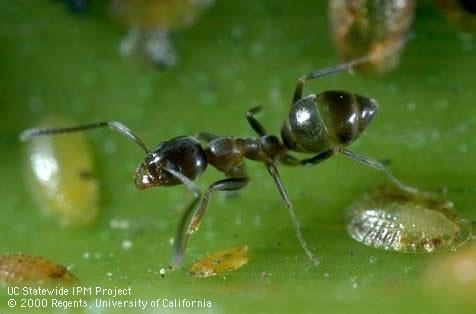 However, applying pyrethroids reduced predatory mites, leading to an outbreak of spider mites. After spending seven days touring four to six farms per day and looking at various practices, Bentley and Brunner spent the next week leading workshops for farmers and discussing integrated pest management (IPM) approaches to managing problems. 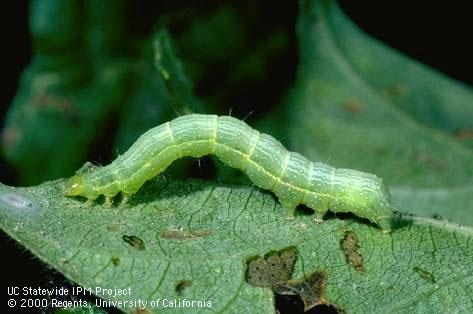 Using the UC IPM website, specifically the Pest Management Guidelines for apples and peaches, Bentley and Brunner were able to teach sampling methods, stress the importance of correct pest identification, and encourage growers to spray with the least toxic and disruptive products. 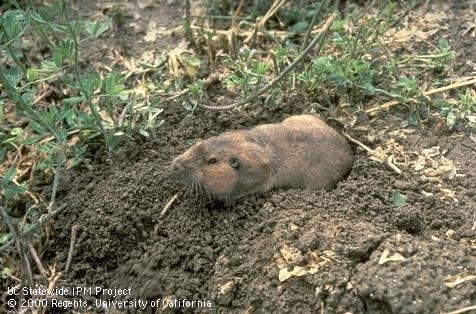 Bentley and Brunner were surprised by the large variety of pesticides available to growers, but were encouraged that farmers were willing to spray only when necessary while being open to other methods of control. 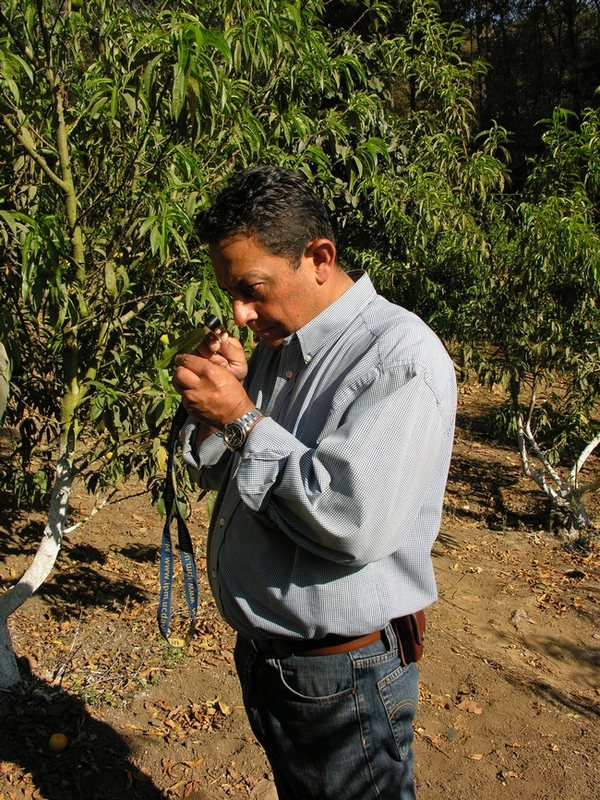 ANAPDE Director, Armando Hernandez, searches for predatory mites on peaches. 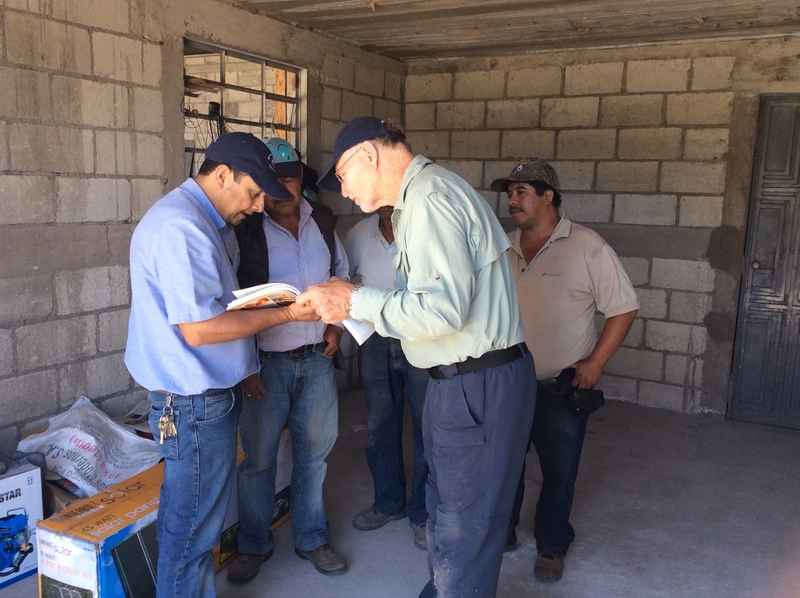 Both entomologists plan to keep the lines of communication open and feel the observations made during this trip could lead to future visits where sustainable pest management programs can be put into action. 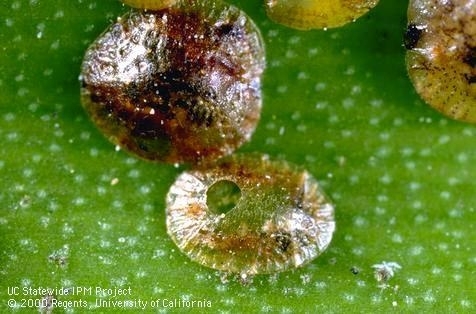 For example, predatory mites were observed in several of the orchards. 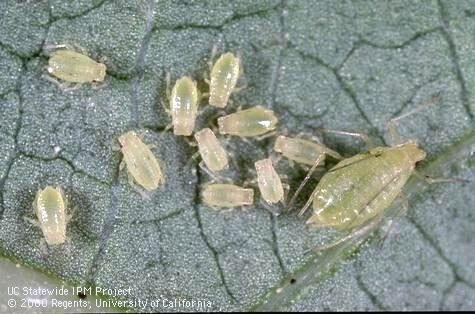 This could lead to developing a biological control program to control spider mites.